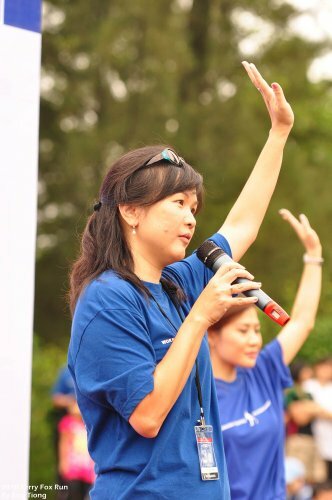 There was a poignant moment before the run was flagged off when the CEO of CARIF, a local non-profit organization dedicated to the research of a cure for cancer, went up to the stage and asked those who know someone who has been affected by cancer to raise their hands… There were thousands of people gathered at the padang in Taman Tasik Titiwangsa and I think you can see a hand from almost everyone. Take a moment to digest that. That’s how pervasive cancer is, sadly. Thirty years ago, a Canadian diagnosed with cancer and with one of his legs amputated, decided to embark on a cross-Canada run to raise money and awareness for cancer research. 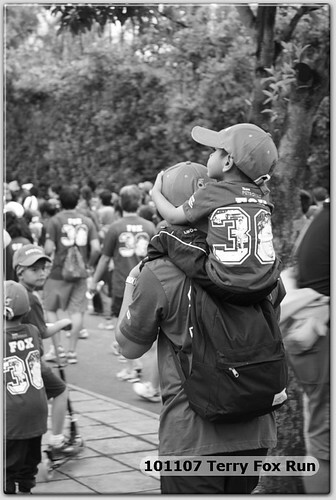 He ran a full marathon (that’s 42.195 km to those counting) every day and so began the Marathon of Hope. 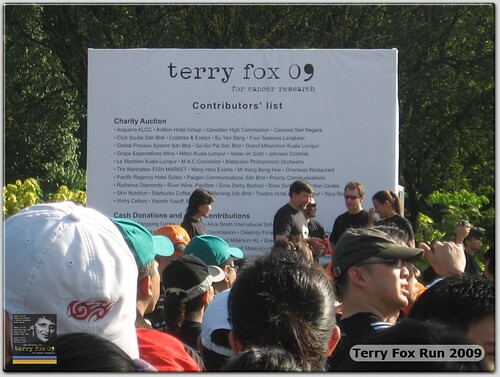 Today the Terry Fox Run is a non-competitive charity event held annually worldwide. 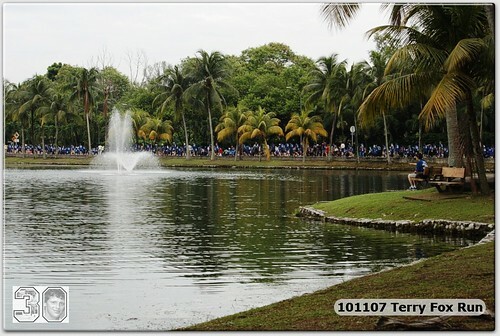 It’s an informal run, where your participation is more important than completing the distance, where everyone can run, walk, ride or wheel. 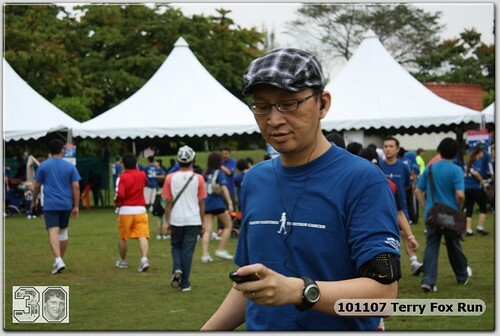 There’s always a famous local celebrity emceeing KL’s Terry Fox Run. This year’s no difference and they had Chermaine Poo (what, you mean you dun know her?) 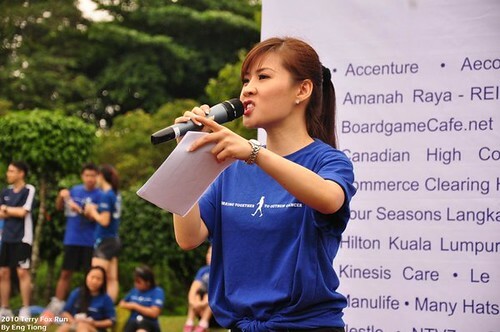 who’s not only pretty but knows something about numbers too as she’s a Chartered Accountant by training. 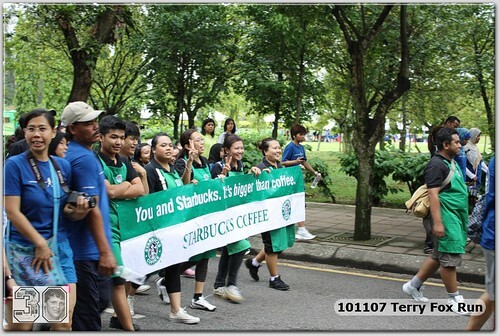 She certainly had the crowd’s attention and did a fantastic job getting everyone ready-to-go! 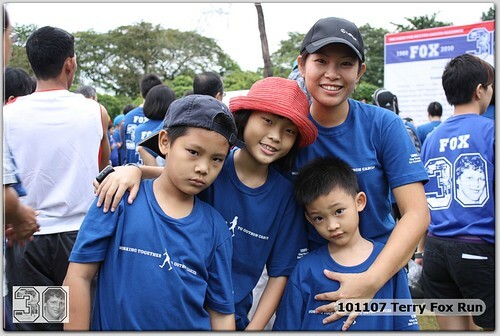 For more pictures of Chermaine, pls check out PM Tey’s Facebook albums. I’ve stopped counting how many pictures of her were in his photo album. LOL. 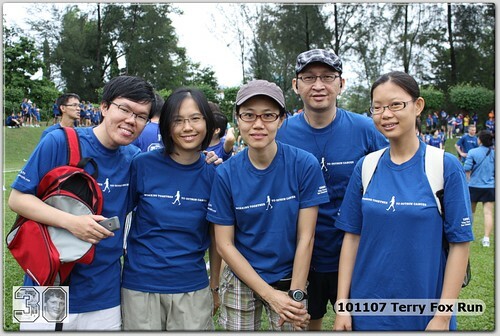 We took part in this run last year but as individual runners. This year, we thought of getting Boardgamecafe.net as part of our social responsibility to contribute towards this charity event by sponsoring their t-shirts. In return for our sponsorship, we get to have our Boardgamecafe.net name imprinted on the sleeves of the t-shirts. Cool! 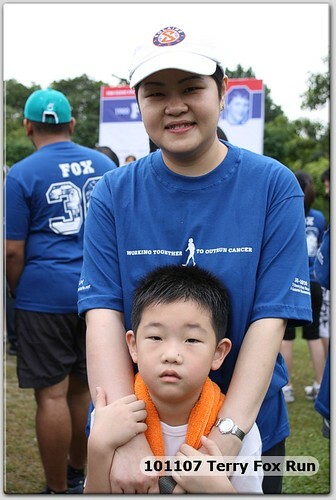 AyHeng, regular OTK kaki and his wife Li Li waking up early to come and support the event! Interestingly President Roslin – of their fave Battlestar Galactica boardgame – was a cancer victim. Wait.. she’s a CYLON! 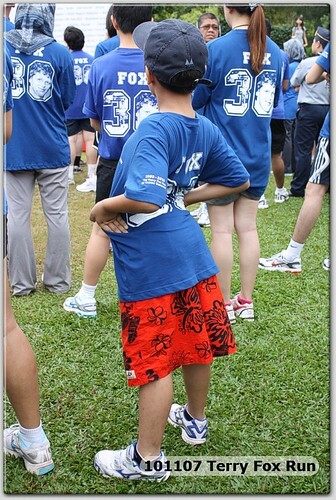 King Richard who ran and ran and ran and ran… so much that he went out of juice later and kept wanting to lie down and tidur!! Hehe. Poor waiyan was the one chaperoning him..
C_mun’s fren… oops we forgot to take any picture of Cheng Yee, a good fren of ours whom we’ve not been catching up with regularly since our Angkor ’08 trip. Ian Tan is missing btw!! This is what jack208 does when he’s not boardgaming…. 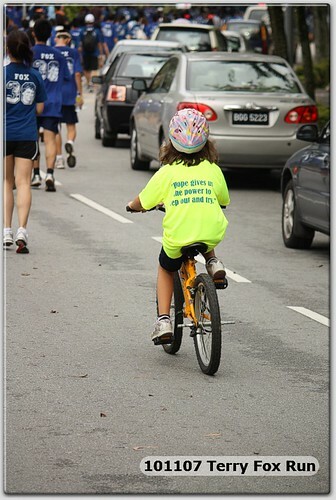 Whether you walk, you run, you cycle, you wheel or you ride…. we all need to start somewhere. 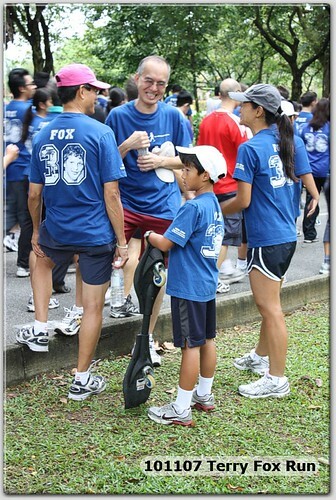 Running – similar to boardgames (we hope) – unites all people regardless of race, profession and age. The family that runs – and play boardgames – together, stays together. 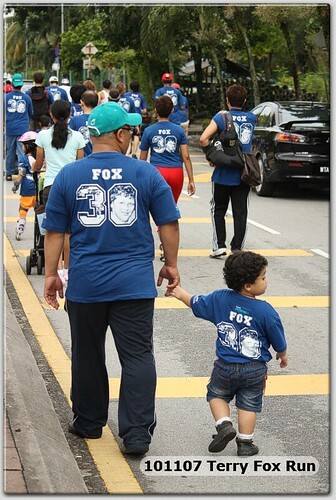 This year is a landmark 30 Years for Terry Fox Run, and their t-shirt design this year is really cool. What? You didn’t buy their t-shirt? 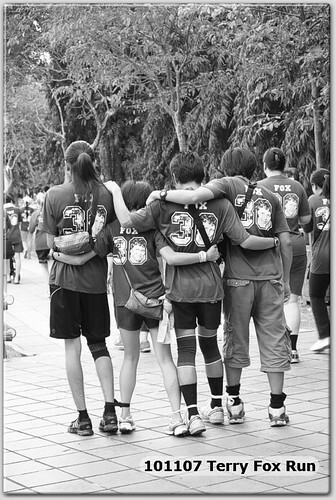 HOPE gives us the belief that we will finish this together… I like this shot very much. Good one, Lai Wah! We were actually not informed that our contributions would enable us to see Boardgamecafe.net’s name in print on the Contributor’s List board so it was a rather nice surprise for us when we saw BGC’s name in the list! 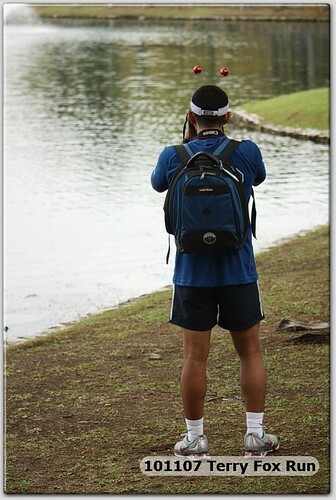 Here’s some pictures taken by Lai Wah for your enjoyment! 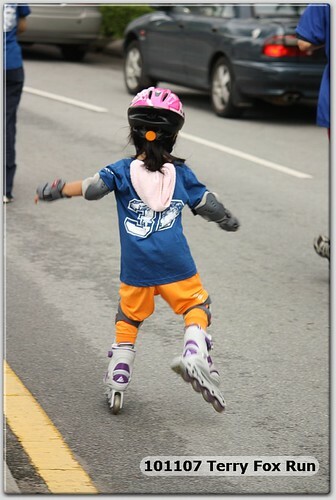 Not just wheels… but wheels-with-style! Wonder where we can get this? 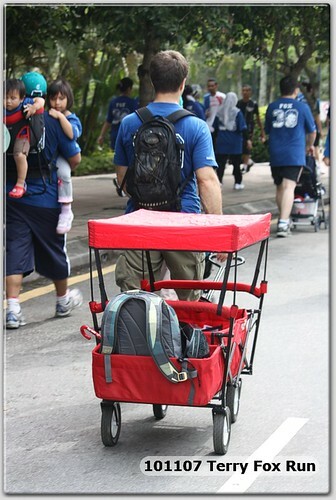 Your own custom trailer, powered by Daddy-Two-Legs!! 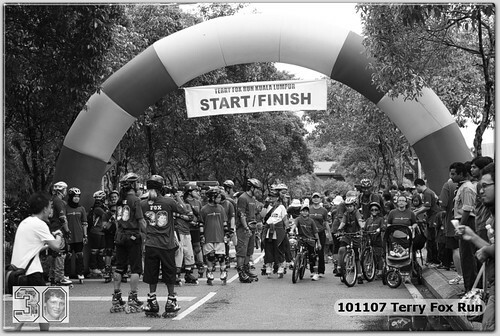 Check out the rest of the photos of this event at our Facebook Album. 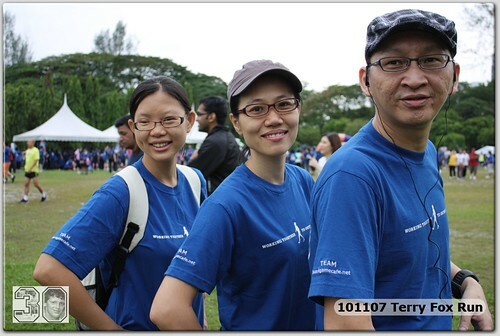 All photos in our Facebook album taken by Lai Wah. 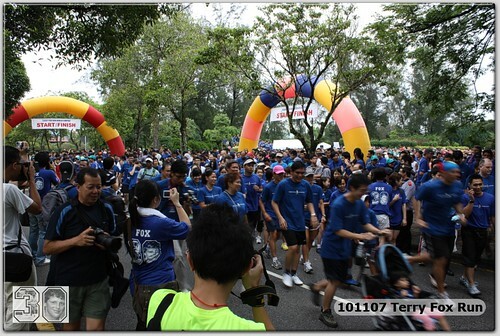 And a special mention for the two “celebrity” in the local running circuit – PM Tey and Pueh Tian – whom have done much to spread the love of running everywhere they go! PM Tey (left) and Pueh Tian lending their support to this event. 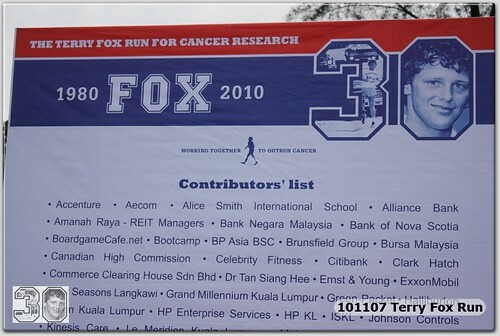 Last but not least, Boardgamecafe.net will like to say thank you from the bottom of our heart to all those who have contributed to the Terry Fox Run in all forms and kinds. We’ll be back for this again next year and we look forward to your wonderful support then!